The HART Design & Manufacturing automatic wheel cutters are designed to maximize production while reducing human contact with product. With a simple touch, the screen changes between exact weight, number of slices, or equal division of a wheel, making it easy to use. The three styles of cutting fit every need. The HART Design automatic wheel cutters can accept wheel sizes up to 17¾” in diameter and 7” in height. Machine yields precise portions per your input – simply select how many wedges you want the wheel cut into or the weight you want your wedges to be! 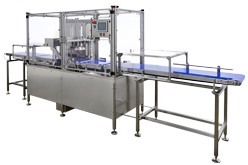 Automatic Precision Cutting Action: Automatically get wedges from your cheese wheels by utilizing this compact, stainless steel electro-pneumatic machine. It loads, pre-weighs, centers, stabilizes, precision cuts, then discharges the cheese wheels (from hard to soft cheeses) continuously.